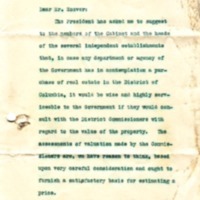 The President has asked me to suggest to the members of the Cabinet and the heads of the several independent establishments that, in case any department or agency of the Government has in contemplation a purchase of real estate in the District of Columbia, it would be wise and highly serviceable to the Government if they would consult with the District Commissioners with regard to the value of the property. The assessments of valuation made by the Commissioners are, we have reason to think, based upon very careful consideration and ought to furnish a satisfactory basis for estimating a price. Tumulty, Joseph P. (Joseph Patrick), 1879-1954, “Joseph P. Tumulty to Herbert Hoover,” 1918 June 1, WWP19428, Hoover Institute at Stanford University Collection, Woodrow Wilson Presidential Library & Museum, Staunton, Virginia.